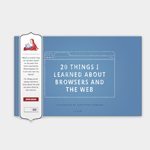 Today, Google released an interactive online book that explains things like HTML, browser extensions, and much more. While this is probably very helpful for less tech-savvy web surfers, I am more excited about the underlying technology, HTML5 & CSS3. The site is a great example of what is possible with the latest updates to HTML and CSS.